Monogram Boho backpacks. 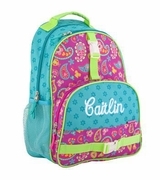 The intricate Bohemian design in coral, turquoise and white on a black background can't be missed on this starburst pattern Boho backpack. This eye-catching decoration with turquoise trim is sure to become your favorite. Roomy main body with front zip pocket for small necessities and side mesh water bottle holder. Comfortable backpack straps or hand carry with the top loop. Ideal for trips around town, school or travel. An easy care micro-fiber fabric. Makes a great gift for graduation or extra hands free travel tote. A matching lunch tote is available search item SWT-8010STAR. Add a monogram for a unique personalized present. The Boho backpack measures 13"W x 16"H x 5.5" across the bottom. Front u-zip pocket, inside padded interior.